Bangles are traditional ornaments worn mostly by South Asian women in India, Pakistan and Bangladesh. 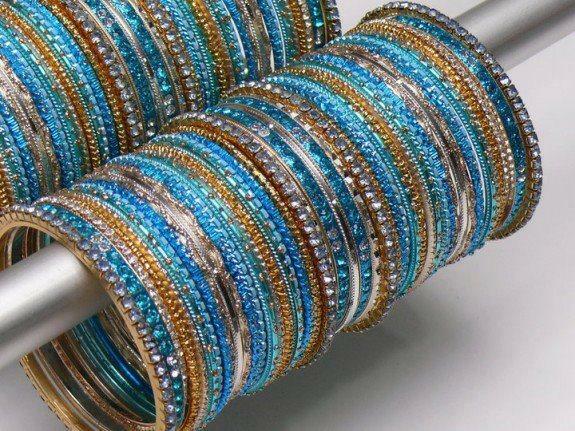 It is tradition that the bride will try to wear as many small glass bangles as possible at her wedding and the honeymoon will end when the last bangle breaks. Bangles also have a very traditional value in Hinduism and it is considered inauspicious to be bare armed for a married woman. Toddler to older woman could wear bangles based on the type of bangles. Bangles made of gold or silver are preferred for toddlers. Some men wear a single bangle on the arm or wrist called kada or kara. In Sikhism, The father of a Sikh bride will give the groom a gold ring, a kara (steel or iron bangle), and a mohra. 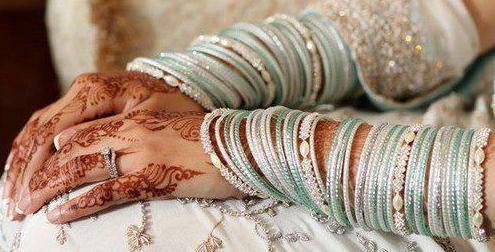 Chooda is a kind of bangle that is worn by Punjabi women on her wedding day. It is a set of white and red bangles with stone work. According to tradition, a woman is not supposed to buy the bangles she will wear. 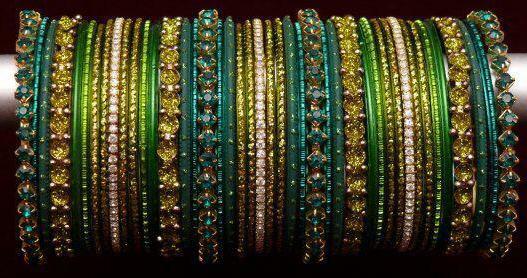 Hyderabad, Pakistan, is the world’s largest producer of Bangles. While Moradabad is India’s largest producer of bangles.